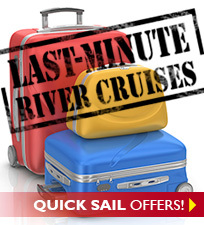 Big savings on river cruises in Europe, Russia, Vietnam & Cambodia. Limited 'Solo' deals for 2019. GREAT DEALS for 2020 river cruises. These days, everyone is looking for a GREAT “deal,” no matter how wealthy they are. We believe strongly that our solo travelers should enjoy the same opportunity to enjoy great savings on many river cruises. Premier works closely with our "solo" travelers, always paying special attention to their needs, desires, and budget. For that — and many other reasons — we've been commended for our service and great solo deals by Janice Waugh of the Solo Traveler Blog, Elizabeth Avery of a solo blog called Solo Trekker 4U, the New York Times, Condé Nast, and many other influential travel publications. In our "Solo" Traveler Hot Deals Section (updated weekly), we feature a number of Premier’s exclusive, “negotiated” deals and other special solo offers from award-winning river cruise lines such as Avalon Waterways, Tauck, Scenic, Uniworld, and Emerald Waterways. On most of the ‘Hot Deal’ cruises, we can offer "solo" travelers either a NO single supplement rate or a significantly lower rate than the usual 150%-200% solo rates featured on lines such as Viking. The most 'Solo'-friendly cruise lines. With that in mind, we can say with certainty that the following river cruise lines are the most SOLO friendly... Uniworld Boutique Collection River Cruises, Emerald Waterways, Avalon Waterways, and Tauck. Of these brands, Tauck, Uniworld and Emerald are all-inclusive river cruise lines. That means once on board, you pay for almost nothing! 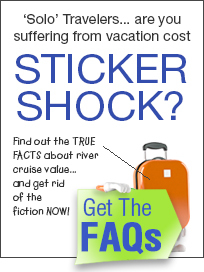 And, on Tauck river cruises you never have to pay a single supplement, never! They have a guaranteed solo rate on each and every European itinerary they offer. Now keep in mind that these guranteed solo rates are in their standard riverview cabins which comes with a nice large window, but they are the same size as all of their other staterooms and with all the same cabin amenities enjoyed in the suites. This really is a great opportunity for "solo" travelers to enjoy Tauck at affordable rates. In recognition of the growing demand by solo travelers who want to enjoy an affordable river cruise, the most solo friendly river cruise line, AmaWaterways, enhanced their solo traveler program in 2018. Now, our solo travelers — on selected ships and departures — can travel in a balcony stateroom or a less expensive window stateroom without paying the dreaded single supplement. In addition, solo-friendly AMA also has a first-night cocktail reception for "solo" cruisers so you can meet each other. Plus, every solo guest on AMA will be invited to dine at the Captain's Table during their cruise. All of AMA's solo offers are capacity controlled, so please CALL NOW FOR COMPLETE DETAILS BEFORE 2019 (and 2020) SPACE IS GONE. Just one more thing for you to consider as a solo traveler. Viking River Cruises is the most well-known brand, but the LEAST solo friendly of all river cruise lines. By that we mean that Viking very rarely offers solo travelers a break on the price. In most cases, Viking charges a surcharge for solo travelers, so please save us both a bit of time and don't request a quote/price for Viking. You are best served by requesting one of the solo friendly lines noted above. Space is limited for 'Solo' travelers so you absolutely MUST book early! Because river cruising is so popular, most departures sell out a full year before the departure date — solo or not! That means booking early for solo travel is ABSOLUTELY even more critical. Why? Because there are ONLY one or two solo cabins on a ship and they sell out quickly; and, as it gets later in the year solo traveler deals become impossible to get. Booking early is easy and not really too painful to your wallet as the deposit is only $200-$400 with the balance due 90 days before you travel — you don't pay for it all upfront — at Premier, we'll even take scheduled payments if that helps — take a look at our FREE Easy Pay Lay Away plan. If you don’t see what you’re looking for below in the cruisGENIE™ Cruise Locator and chart — or you have questions — the best and fastest way to get answers is to call and speak with one of our Solo Travel Experts. By chatting with an expert, they may be able to find ways for you to enjoy the cruise of your choice at a very special rate. That, along with ensuring that solo travelers are on the BEST cruise line — ones that make you feel at home — is what we do better than any other travel agency. River cruising as a 'Solo' traveler is a very affordable, rewarding, and safe vacation. If you haven't read the many solo traveler informational articles on our site, just go to the top of this page and click on "The Solo Traveler" tab (or the left column sidebar navigation), to learn why a river cruise is the ideal vacation for those who choose to travel solo. 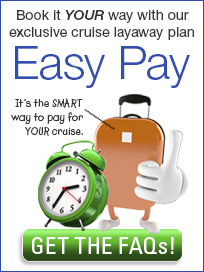 Use the cruisGENIE™ Cruise Locator below to narrow down your HOT DEALS choices. It’s EASY, FAST and will help match you up with the perfect river cruise vacation! When you’re ready to book or need more information, just give one of our Solo Travel Experts a call at 1-855-255-1200, to begin planning your cruise. Premier guarantees you’ll always receive the BEST Service and the BEST price — you can count on it! Price displayed is Special Solo rate for least expensive window stateroom.